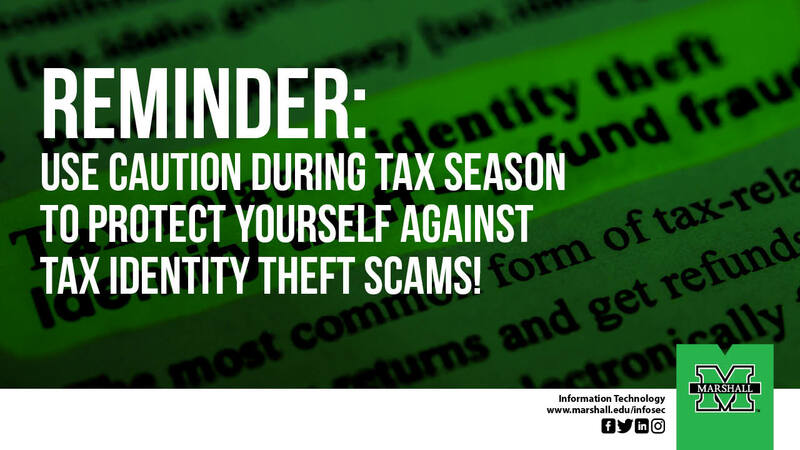 Marshall University Information Technology (MUIT) wants to warn the Marshall community to be on the look-out for Tax Identity Theft scams. Many federal agencies are offering information and resources to help consumers learn to protect themselves from tax-related identity theft and Internal Revenue Service (IRS) imposter scams. MUIT along with the National Cybersecurity & Communications Integration Center (NCCIC) and the United States Computer Emergency Readiness Team (US-CERT) encourage consumers to review IRS publication Taxes.Security.Together. and NCCIC/US-CERT Tip Preventing and Responding to Identity Theft. Users can also participate in a series of free webinars and chats on avoiding tax identity theft, hosted by the Federal Trade Commission, IRS, Department of Veterans Affairs, and others. For more information about Information Security at Marshall University please visit our website: www.marshall.edu/infosec .